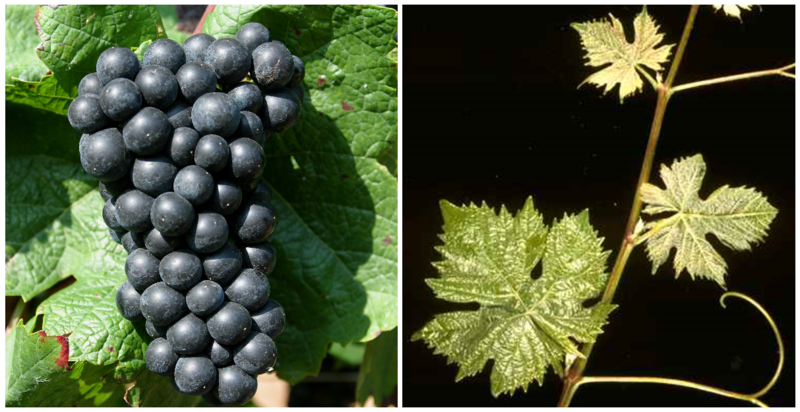 The red grape variety is a new breed between Blue Portuguese x Pinot Noir (What happened after 2012 DNA analysis was confirmed). Synonyms are Geilweilerhof 4-25-7 and Red Spotted. The crossing took place in 1927 by Peter Morio (1887-1960) at the vine breeding institute Geilweilerhof in Siebeldingen-Palatinate. Here she was Bernhard Husfeld (1900-1970) in the 1950s further processed or selected. The variety protection was granted in 1974. The variety was crossing partner in the new breed Calandro, The medium-maturing, high-yielding vine has a medium Botrytis resistance but is good resistant to chlorosis. virus. Verrieseln and frost, She tends to stem necrosis, The variety provides the Pinot Noir similar, but slightly acidic, extract-rich red wines with aromas of burgers and cherries. In 2009 was in Germany the acreage is 405 hectares. In the Switzerland is thus less than a hectare planted. This page was last modified at 28 December 2018 at 16:41.